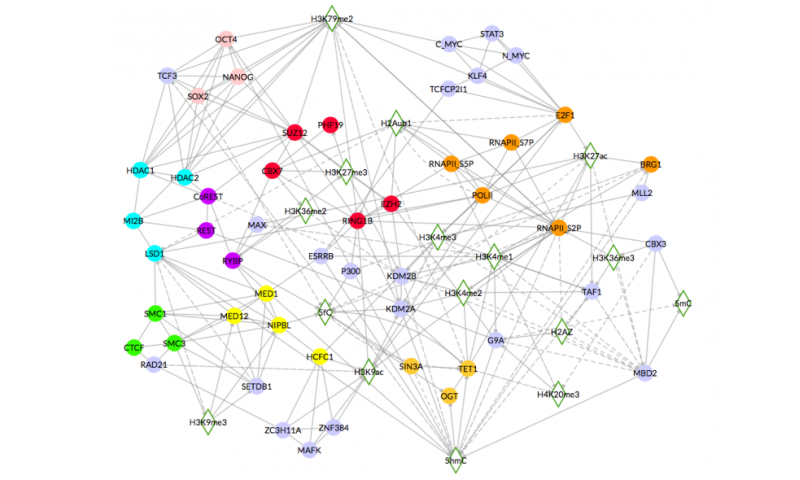 The team of the Structural Computational Biology Group of the Spanish National Cancer Research Centre (CNIO), headed by Alfonso Valencia, the Centre's Vice-Director of Basic Research, has used network theory to build and study the first communication network between the components that constitute this genomic make up, known as epigenome. The conclusions were published today in the journal Cell Reports. In order to study this aspect in greater depth, the researchers collected data from literature that include 3 chemical modifications in cytosine (letter "C" of DNA), 13 modifications of histones (the proteins around which DNA is wrapped) and 61 DNA associated proteins, from mouse embryonic stem cells. The authors apply mathematical algorithms used to measure the popularity and influence of websites (such as Wikipedia or Facebook) to the network of epigenomic communication. They reached the conclusion that the 5hmC mark (chemical modification of the cytosine with a hydroxymethyl group in position 5') is the most influential component of this network in stem cells. "We have approached systems biology by studying chromatin signals [the DNA with chemical modifications and proteins that bind to it] as a comprehensive system and from this we have built the first communication network between these signals," says Daniel Rico, the CNIO researcher who has directed the study together with Valencia. "In this case we are speaking of an internal communication system inside each cell,, more specifically within the nucleus." The next step is to establish whether the results can also be assigned to other cell types. "We knew that 5hmC was extremely abundant in embryonic stem cells, but now we also know that this is true for other cell types, such as neurons or certain tumours," assert the authors of the paper. And they add: "Cancer cells have stem cell features; therefore it seems appropriate to investigate whether these results can also be transferred to cancer epigenomes, which would provide new outlooks on how they are regulated."